I love doing custom appliques for people because sometimes they are things that I would never have thought of myself. 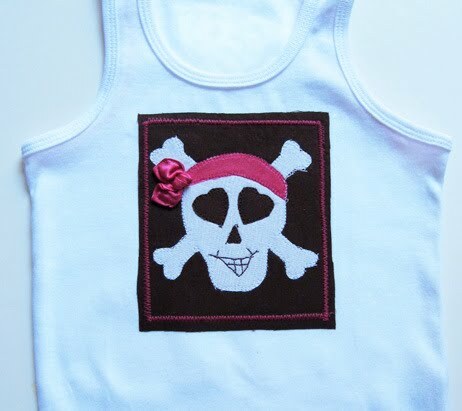 Like this “Pink Pirate” applique that one customer purchased with the pink tutu and brown leggings…it turned out so cute. It was for her daughter’s Pink Pirate themed birthday party. I wanted to make something pirate-y but not too scary. And now I have a stencil of a skull/crossbones so I can do other fun pirate appliques.